The Baratza Vario Semi Pro Grinder will be out of stock until the end of March. We are accepting orders and will ship as soon as they are back in inventory. Your credit card will not be charged until we ship. All other Baratza models are in stock. 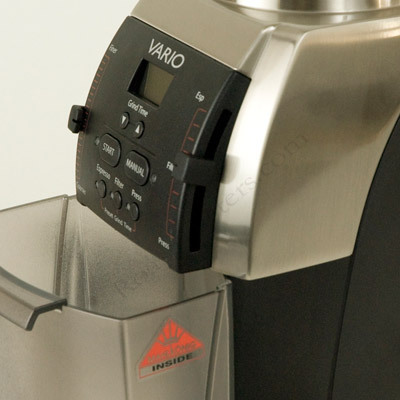 The Vario fills the niche between large professional grinders and home grinders. It has a small footprint, full grind range, rapidly repeatable micro grind adjustment and quick grinding speed. This latest model (886) includes the addition of a memory, so that the programmable settings will be retained even when the grinder is unplugged. Also added is a sleep mode so the grinder will shut down, and the blue 'on' light will go out, when the grinder is not in use. 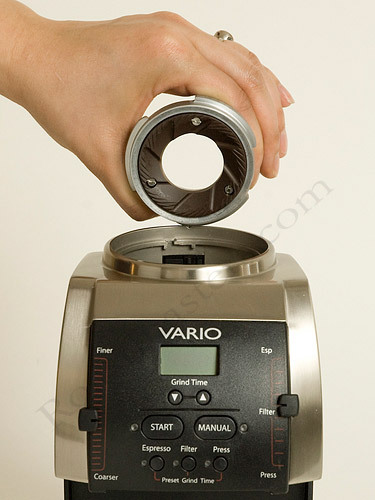 The Vario has the performance of a large grinder without the need for all the counter space. Measuring only 5 in. 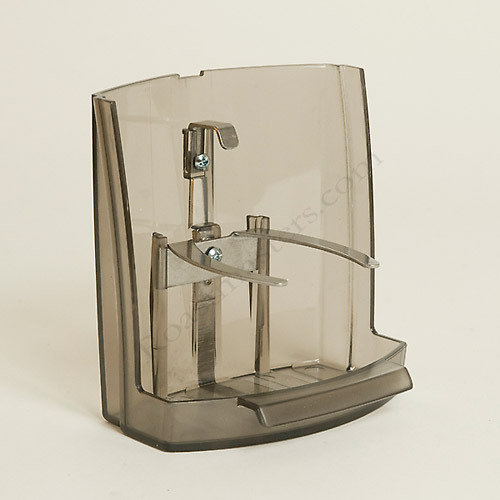 wide and 7 in.� deep it will fit on almost any counter. At only 14.5' in. tall, it fits under overhead cupboards. All functions are controlled from the front, so walls or equipment directly beside it is not a problem. Three user programmable buttons allow for grind time setting within 0.1 second (about 0.2 gram). 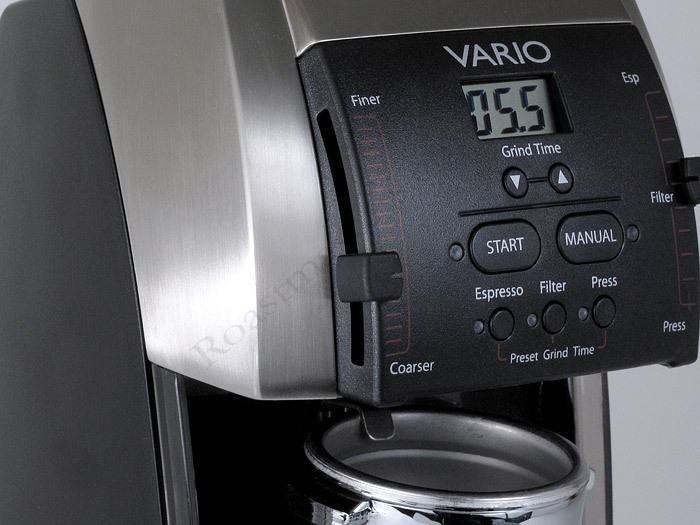 Simply press the START button, and the Vario automatically delivers precise dosing. 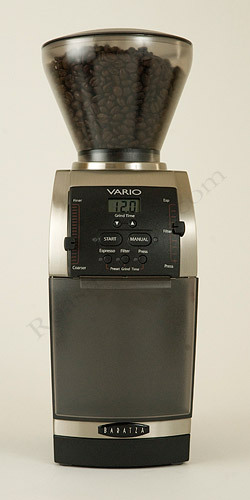 The Vario grinds 1.5 grams/second at Espresso and 2.5 grams/second at Press. The speed of the grind is truly Professional. Baratza's exclusive PortaHolder permits hands free grinding into any Espresso portafilter. 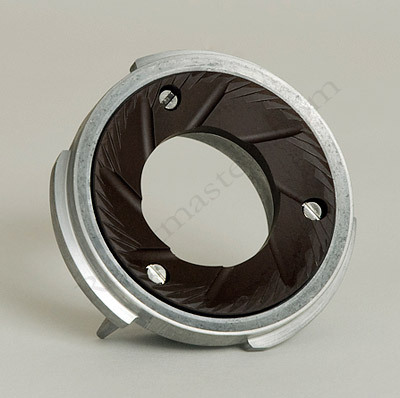 The grinder comes with both a grinds drawer for catching grounds as well as new PortaHolder. Dowload the Vario user manual.